Snakes are often depicted as evil and scary, but not all snakes are venomous or dangerous. There are only two poisonous snakes found in New England, the Copperhead and the Timber Rattlesnake, but they are not found in the Cape Cod region. There are about 8 different species of snakes found in New England and they all belong to the colubrid family – the family of snakes that represent ¾ of the world’s population. The best chance of finding snakes are on hot days when the snakes bask in the sun or amongst wood piles. Come and enjoy the beginning of spring at the Lloyd Center by taking a hike on the trails; you may find a snake or two along the trail edge! Walk quietly and you may even hear the crackle of leaves as a snake slithers by to look for its next prey. 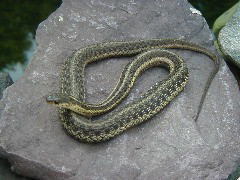 If you are not the adventurous type, you can always see the Garter Snake we have as this month’s Creature Feature in the Nature Center. Enjoy the list of snakes that are found in Massachusetts. Embrace the wonders of snakes!